Jiangxi International Technology Trade Co.
SQC wet high intensity magnetic separator is one kind of effective equipment for processing fine, feebly magnetic minerals, such as hematite, limonite, wolframite, ilmenite, and tantalum-niobium, etc. In recent years, it is also more and more applied in purifying quartz, feldspar and nephline. Its magnetic system is a ring-shape chain closed magnetic circuit with energizing coils made of copper tube and cooled internally by water. Grooved plates made of magnetic conductive stainless steel are used as magnetic matrix. It possesses the following advantage: short magnetic circuit, little magnetic flux leakage, high magnetic intensity, low energy consumption, fine beneficiating results, simple structure and easy to maintain. They have found widely uses in more than 20 mineral processing plants of China. 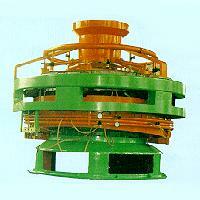 We offer new and efficient magnetic separators for mineral processing industry. Product of Chinese invention medal(A03944).